How does the sunshine pill help us to think? Recent research shows that exposure to sunlight causes a cascade of chemical reactions that help us to think. Especially relevant is the fact that exposure to UV elevates a natural chemical known as blood urocanic acid (UCA). This chemical then crosses the blood-brain barrier. This chemical is then converted by a metabolic process to glutamate, and consequently, nerve synapses in the brain are enhanced. As a result, there were improvements in both physical learning (motor learning) and object recognition memory, which is an ability to think. Is there more research indicating that sun exposure enhances the ability to think? In addition, the ability to think has been shown in many research studies to improve with sunlight. Most noteworthy is a 2013 article, published in the journal Neurology. It reveals that among people with high sun exposure, the risk of Alzheimer’s disease (AD) is profoundly decreased. Therefore, they are able to think more clearly than those who receive low sun exposure. Finally, research published in the journal Endocrinology, sums up the effects of the sun on the brain and body: It is entitled, “How ultraviolet light touches the brain and endocrine system through skin, and why.” The authors begin their abstract by stating that “the skin is a self-regulating protective barrier organ that is empowered with sensory and computing capabilities to counteract the environmental stressors to maintain/restore disrupted cutaneous homeostasis.” In other words, the skin has the ability to take on what life deals it, and maintain its equilibrium and balance. In addition, the skin communicates bidirectionally with the central nervous, endocrine and immune systems. Thus, it helps to maintain balance for all body systems, including the ability to think. Safely soak up the non-burning sunlight and enhance your intelligence! White RS, Lipton RB, Hall CB, Steinerman JR. Nonmelanoma skin cancer is associated with reduced Alzheimer disease risk. Neurology. 2013 21;80(21):1966-72. Get your sun and save your mind! Alzheimer’s disease is closely associated with a lack of sun exposure. Alzheimer’s disease is a plague in our modern world. It is a progressive mental deterioration that can occur in middle or old age, due to degeneration of the brain. Alzheimer’s is also the most common cause of premature senility. The United States will see a 44 percent increase in individuals with Alzheimer’s disease by 2025. First of all, the disease occurs because amyloid plaques appear in brain tissue. These plaques consist of tangles of amyloid protein (a complex protein resembling starch) in nervous tissue. They are pathological markers of the disease that are found in spaces between the brain’s nerve cells. As a result of these plaques, the brain loses its ability to function properly. My wife, Vicki, and I worked with residents of an assisted-care facility for over three years. We conducted and supervised church meetings for many disabled, elderly people. Because we worked up close and personally with these residents, we understood the devastating effects of Alzheimer’s. Many of these residents could not find their way to the church meeting room without our assistance. Therefore, they obviously had the disease. Additionally, it was manifest because many of them were unable to recognize us after our being away for a day. Also, they were prone to simply get up and leave the building and be found (if lucky) wandering outside. Does sun exposure help to reduce Alzheimer’s? First of all, research indicates that vitamin D and omega 3 fatty acids may help in removing the aforementioned plaques. Therefore, they reduce the risk or severity of AD. So, the disease may be lessened by sun exposure, since 90% of vitamin D produced in the US population is due to sun exposure. Are there other indications that sun exposure is associate to reduced risk? Sun exposure directly correlates to non-melanoma skin cancer (NMSC). Therefore, the latter is often used as a sun-exposure indicator. It is thus compared with various diseases to evaluate the relationship between them and sun exposure. A 2013 article, published in the journal Neurology, reveals that among people with NMSC, the risk of Alzheimer’s disease (AD) is profoundly decreased: Those with NMSC had a 79% reduction in disease risk. Stated another way, those without NMSC had about five times the risk of Alzheimer’s! Of course, this demonstrates the importance of sun exposure in reducing the risk, whether due to vitamin D production of from other photoproducts of the sun. So, what is the bottom line? Be sure to obtain some unscreened, non-burning sun exposure and keep your marbles! Champeau R. Vitamin D, omega-3 help clear amyloid plaques found in Alzheimer’s. UCLA Newsroom 2013. Câmara AB, de Souza ID, Dalmolin RJS. Sunlight Incidence, Vitamin D Deficiency, and Alzheimer’s Disease. J Med Food. 2018 Mar 22 [Epub ahead of print]. We have previously discussed information indicating that people who received more sunlight had better brain function, and noted the relationship between Alzheimer’s, autism and other mental disorders and lack of sun. A recent study compared cognitive impairment and sunlight in a 15-year residential history of varying degrees of sunlight exposure. It showed that cognitive impairment in persons who were below the median exposure to sunlight was 88% greater than those who were above the median. The researchers mentioned vitamin D as a possible mechanism by which sunlight positively influenced cognition, but also remarked that regulation of the circadian rhythm by sunlight could be a factor. These same investigators had previously shown that lower levels of sunlight exposure resulted in a 2.58-times higher incidence of cognitive impairment. So, if you would like to maintain your cognitive abilities, soak up a little non-burning sunlight! Kent ST, Kabagambe EK, Wadley VG, Howard VJ, Crosson WL, Al-Hamdan MZ, Judd SE, Peace F, McClure LA. The relationship between long-term sunlight radiation and cognitive decline in the REGARDS cohort study. Int J Biometeorol. 2014 Apr;58(3):361-70. Striking back at Alzheimer’s Disease and Non-Alzheimer’s Dementia: Can Vitamin D and Sunlight Help? One of the fears of aging is that memory will fade and full-fledged Alzheimer’s disease will develop. Amyloid plaques, consisting of tangles of amyloid protein (a complex protein resembling starch) in nervous tissue, are pathological markers of Alzheimer’s disease that are found in the spaces between the brain’s nerve cells. Recent research indicates that vitamin D and omega 3 fatty acids may help to remove these plaques and thereby reduce the risk or severity of Alzheimer’s. The research, described in a press release from UCLA, compared the immune system changes and inflammatory markers in the blood from two different groups, one group with Alzheimer’s and another without the disease. The researchers showed that both vitamin D and omega 3 improved the ability of macrophages, large white blood cells, to clear amyloid plaques in those with Alzheimer’s. Macrophages work by folding themselves around foreign particles and then disposing of them—a process known as phagocytosis. 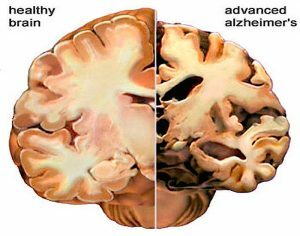 Cell death caused by Alzheimer’s disease was also diminished, and inflammatory markers diminished in those who suffered from excessive inflammation. As impressive as the correlation of low vitamin D and Alzheimer’s, it pales in comparison to the potential of vitamin D to reduce the risk of non-Alzheimer’s dementia. A seven-year study showed that the risk of non-Alzheimer’s dementia was 19.7 times higher in people who had vitamin D levels less than 10 ng/ml (severely deficient) than those who had higher levels. All tissues in the body have vitamin D receptors, and the brain and central nervous system must have vitamin D to function properly. A little non-burning sunlight exposure at midday can produce vast quantities of vitamin D. If the memory is fading fast, it may be time to spend more time in the sun. Remember that sun exposure is the only natural way to obtain that vitally important hormone, vitamin D.
 Champeau R. Vitamin D, omega-3 may help clear amyloid plaques found in Alzheimer’s. UCLA Newsroom Feb 2013. Soni M et al. Vitamin D and cognitive function. Scand J Clin Lab Invest Suppl. 2012;243:79-82. Grant WB. Does vitamin D reduce the risk of dementia? J Alzheimer’s Dis 2009;17(1):151-9. Pogge E, Vitamin D and Alzheimer’s disease: is there a link? Consult Pharm. 2010;25(7):440-50. Annweiler C, et al. Serum vitamin D deficiency as a predictor of incident non-Alzheimer dementias: a 7-year longitudinal study. Dement Geriatr Cogn Disord 2011;32(4):273-8.